Looking to impress your friends or add a bar room trick to your repertoire? Or maybe you just want to show off to the accounting department. 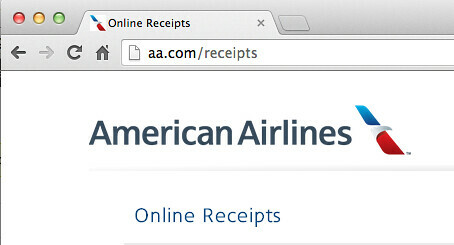 Here’s how you can retrieve a copy of a receipt for an inflight purchase. And wait for your results. There’s even an option to print a copy. 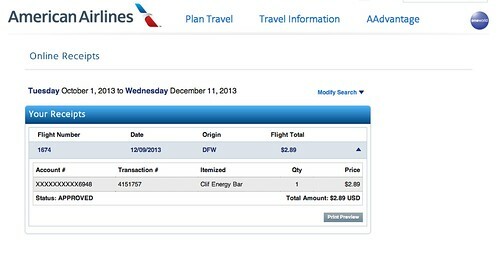 It doesn’t display Gogo Wi-Fi purchases, but it works for any transaction processed by a flight attendant. Never again will your Fruit and Nut Mix purchase go unreimbursed! 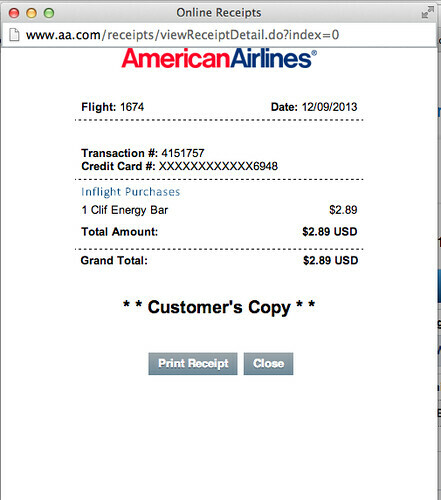 I used AA.com to try to retrieve my receipt for a meal I paid with my credit card on board AA34 on 20th May 2015 as directed by the flight attendant. Last 4 digits of my credit card is 9505. However, I there was no such record found. My experience has been that it can sometime take a few days for the transaction to post. Did you ever retrieve your receipt? No, always got a negative message that search could not be found. Gave up and will not be using this function or purchasing anything else on board if use AA again. I had the same problem as Paul Tay. I made a trip on final of July and so far there’s no online receipt.